“Es brennt – unser Shtetl brennt!” – the poem by Mordechai Gebirtig about the pogroms, the dark foreboding of the attempted annihilation of the Jewish people, was captivatingly rendered by guitarist Vladimir Fridman in the Hall of Remembrance of the U.S. Holocaust Memorial Museum on Friday, January 25, 2019 to bow to the souls of the six million Jews lost in the Holocaust. After a moving ceremony in the presence of a steadily decreasing numbers of Holocaust survivors, guests joined in lighting candles to the memories of the victims of the mass murder by the Nazis and their accomplices. 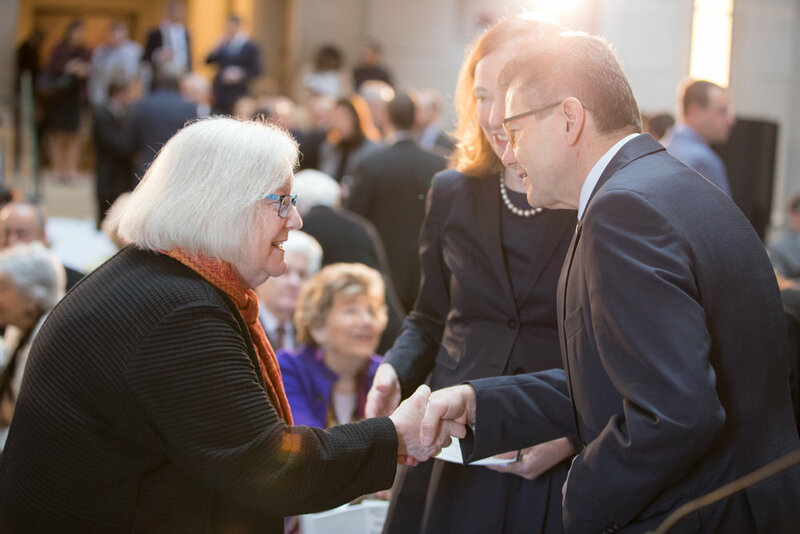 Ambassador Waldner joined Rose-Helene Spreiregen, a French Holocaust survivor and Museum volunteer, to pay respect to the victims within the framework of the 2019 International Holocaust Remembrance Day Commemoration. Ambassador Wolfgang Waldner, keynote speakers German Ambassador Emily Haber and Louise Lawrence-Israels (left), Holocaust survivor and Museum volunteer.